“Poor? Eat stale bread” … I was amused yesterday to see this news headline, (I’ll read anything these days so long as it isn’t about Australia’s upcoming Federal election) reporting Jamie Oliver once again making controversial statements during a Radio Times interview. What he actually said was “…The fascinating thing for me is that seven times out of 10, the poorest families in this country choose the most expensive way to hydrate and feed their families. The ready meals, the convenience foods…”. Personally, what I find fascinating and perplexing is the richest families choose it also. The article coincided with me making meatloaf for dinner only the night before. A goodly component of my meatloaf recipe is what would pass for stale bread. The G.O. and I don’t eat a lot bread but there’s always a loaf of sourdough in the freezer, which I use regularly as a cooking ingredient… bread & tomato salad, meatloaf, sometimes rissoles, meat sauce if I want it thick and unctuous, chicken stuffing, breadcrumbs, occasionally bread & butter pudding, plus the odd slice of toast with cheese, avocado or eggs for a weekend breakfast, and toasted sandwiches with pumpkin soup. We eat white bread occasionally. When we drive up the coast we’ll hit the shops before the last leg to Taylors Arm at lunchtime with 6 hours of driving behind us, plus an hour or two more ahead cleaning and unpacking. The G.O. will look longingly at the white sliced loaves in the shop, so we’ll take one home to make cheese/sliced turkey & salad sandwiches with good butter, mayo & mustard, washed down with a cup of tea to keep us going. But it’s white bread lust not love. Occasionally I’ll get an on-my-way-home-from-work call from the G.O. who asks are you near the shops? I feel like bread. I know he means the white sliced stuff, so I grab a $2.50 loaf because he will eat 2 or 4 slices then say this is awful stuff, and it will go in the bin, one of the few things we waste. I hate waste and could use it up but the bin is the best place for it. Cost approx. $37 (*$5.24 rounding up and partial items) plus 60 minutes electricity for oven. This fed us 10-12 portions: 2 dinners for 2 (generous servings for the G.O. ), and 3 days of smoko-lunch for the G.O., so $3.08 – $3.70 per portion. It would easily feed an average family of 2 adults and 2 kids for 2 nights, and maybe a couple of sandwiches. I could have omitted or used cheaper bacon, and also cheaper mince, reducing the cost. Using the beef alone without the bread filler would have made it not near as delicious, nor as economical. We’re fortunate. Our first consideration for food isn’t what can we afford? Meatloaf is not the cheapest meal we eat but it’s a favourite, simple & quick to prepare for a mid-week dinner, nutritious and versatile. Neither is it the most expensive. Eat stale bread? We could do a lot worse. There isn’t a lot happening in our life at the moment, and although it’s not my intention for elladee_words to become a food blog I’ve always blogged about what’s on my plate figuratively and literally. It’s been coming for a while but it feels like the G.O. and are shaking off the tentacles of food consumerism and taking a leap into food consciousness. It’s exciting. I cannot fully express how empowering it feels. Chicken nuggets under the microscope… after watching this I’m so glad I’ve never eaten a chicken nugget. 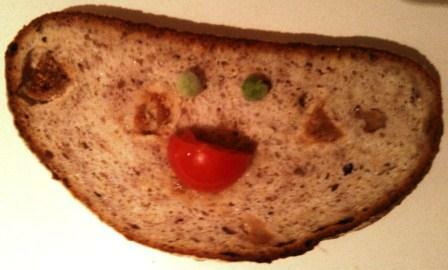 This entry was posted in Blog and tagged Australia, bread, food, my life, sustainable living. Mmmm… yum. 🙂 I haven’t made meatloaf in years but now that the Daughter and I are both needing to take in lunches I may resurrect that old recipe. It’s similar to yours, especially the stale bread part, but Mum always put onions, garlic and sweet paprika in. Ah, white bread. Yes, these days I have real trouble digesting it but I think of it longingly. Meatloaf is a favourite and instead of the bread I have always used oats. We love meatloaf sandwiches (I use mountain bread) made from the leftovers, and yes it is a fairly economical meal, but we too are fortunate, and can eat based more on consciousness than on cost. It is a whole new world. It is so interesting to read about another person’s journey through these phases of life. Thank you for sharing. Oats! Good idea, next time I make meatloaf I will try that 🙂 Economical is a good description. Meatloaf isn’t cheap but it’s nutritious and goes a long way in ratio to the ingredients and prep time. It’s via blogging and the WordPress community that I finally found the tools and impetus to make the changes that seemed so elusive. In turn, blogging about it gets me valuable feedback, and more information. There’s no doubt that economical meals can be made using fresh ingredients rather than pre-prepared, processed foods. I never buy stuff like that anymore. I never did very often anyway – it’s just that I like to know what’s in the food I’m eating. Growing your own, or picking up a big bag of vegetables from a farmer’s market and then making meals (which you can refrigerate or freeze if necessary) are a great way to save money. What amazes me is that people like your Mr. Oliver are quick to make comments about the poor in a way that seems to demean them, but very few people ask the poor WHY they eat and drink the way they do. You put much thought into food preparation. Many people do not, and those are the ones that are influenced by clever marketers. Even with the thought I put into eating, I find myself often driving by a fast food restaurant and thinking of going inside. And the truth is that most of their food tastes like crap, so why am I wanting it? I couldn’t say if I thought J.O. makes comments or intends to demean the poor in general but I was puzzled because there was no expansion in the article re the bread reference, maybe the media is the culprit in this instance. This article, McDonald’s profits by targeting low-income consumers, minorities, http://northernstar.info/opinion/article_3d2a1e3e-a83f-5421-bc02-d01646921582.html suggests some people are very interested in why the poor eat and drink they way they do and seek to influence it. But yes, many judge, and few ask, I agree. I think the answer to the question “why am I wanting it [fast food]?” is connected. In the interview J.O. says in a roundabout way Britain is tending to miss that cultural food identity that enables many poorer nation’s people to eat better cheaply. This was echoed for the US in Barbara Kingsolver’s Animal, Vegetable, Miracle. Both J.O. and B.L. seek to provide everyone, not just the poor, with tools to counteract this, but I take into consideration both have profiles that contribute to their earnings. I personally feel their concerns are however sincere. My belief is advertising has skewed our cultural food identity away from tradtional and towards corporatised industrialised foods, and that is why when we see the fast food restaurants we are reactive. I clearly remember the day in 1975 when I was 9 that I ate my true first fast food meal – KFC. And yes, fast food tastes like crap now. I believe it really has devolved from what it was initially. I still eat some fast food on occasion (less and less) but fortunately I have a family cultural food identity, which I value, to balance this. Some don’t. We are losing generations who can prepare their own meals, let alone grow some of the ingredients. There was a TV program on here a few years ago, that was comparing the eating habits of the various classes. Whether it was edited to how the program makers wanted it to appear, I don’t know, but it was so apparent that the poorer the folk, the more convenience foods they ate. I’m not a big sliced bread eater, but I do have a passion for some of the specialist loaves that Tesco produce. Sunflower and honey loaf, Mediterranean olive bread, walnut bread loaf, to name three. Mmm. It’s hard to generalise but from the reading I have done, it seems fast food companies and food manufacturers are very aware of food demographics and work them to their benefit. There are more fast food outlets here than greengrocers and farmers markets but in many places in Europe for example, that would not be the case, as people still identify with their own food culture, not one that has been marketed to them. There are always variations. I know people on low fixed incomes who live & eat very well, others who don’t manage well because of their reluctance to face reality that they can’t afford take-aways and pre-prepared food, and some who successfully balance the 2. People with higher incomes do have an advantage but we all need to eat good food. I like the idea that everyone should have the same tools & information, if not the same income. I cannot speak for all American cities, let alone cities worldwide but, in my limited experience, poor people do not have access to the foods — fresh fruits and vegetables — that the rest of us take for granted. Years ago, there were “Mom & Pop” groceries in every neighborhood. They were forced out of business when the large grocery stores came in. Now, whether its due to actual crime or the fear of it, the large grocery chains have left, leaving the poor without a means of getting fresh ingredients. I’m not suggesting that a new grocery will solve issues like fast food companies targeting the poor, but it will offer a choice where today there is none. Add nutrition education and we may see things change. I’m stunned. Availability of fresh fruit & veg would help to some extent I think. If it’s not there and a fast food outlet is… I’m a skeptic, if the cost benefit analysis came out on the side of profit, the grocery chains would find a way. That’s very well put. We cannot expect anyone else to look after our interests… I’m guilty of being a bit slow on the uptake, I hadn’t realized how much had changed, for the worse, in the food arena. We love meat loaf – so many ways to change it up – and you can get multiple meals out of one cooking. Sourdough bread is the best. The deal with US “food deserts” (the trendy last year’s term) is that yes, in some areas there are no mega marts and sometimes a few mom and pop stores – the quickie marts carry some produce, but only what sells quickly as they don’t want to lose money. Part of the reason for lack of stores? Here, the neighborhoods often resent the owners (especially if foreign or not living there), mobs of school kids run in as a group and steal stuff, druggies/drunks go in, rob, and beat-up the owners. Many people find it easier to pick up fast foods than cook. The big stores will build where there’s customers and profit – and the city gives tax breaks/financial benefits to grocers who build in underserved areas. There is a large number of small ethnic groceries – but these are always trying to make a profit and not get torn up by miserable people who just see it as a place to rob and don’t realize/care they are stealing from the neighborhood. They can just rebuild so many times. An old saying “shouldn’t bite the hand that feeds you” has taken on a new somber meaning these days. Children get healthy meals for free at schools: breakfasts, lunch and snacks in Houston – Many schools send home sandwiches/food for dinner/weekends. There are program/school classes during the summer to try and make sure the kids eat. The food banks try to hand out veggies and instructions how to cook them. Groups do encourage /build gardens in school yards, parks, and in containers. Vandalism does occur, but many do enjoy growing and eating their own food. It’s an education process – hopefully the kids will get hooked on veggies. There are a couple of food vendor truck that sell produce in the neighborhoods – funded by grants. With public transportation, and food stamp programs, healthy food choices are available. But the bottom line is there has to be customers/people willing to prepare and cook rather than buy fast food. People here have choices. Some choose to live on junk and give their kids junk – it’s easier. Wow, some people call what’s happened to our society progress and evolution, others get to be classified as ‘food deserts’. What we hear from the media is stuff like “Mayor Giuliani claims that his ‘zero tolerance’ policy has brought New York City’s crime rate down to record lows”, etc. I’d never heard of ‘food deserts’ even though in Australia, especially in remote locations there are areas that would qualify. In city areas too there are food programs.